Neurotransmitters are chemical messengers that allow signals to cross synapses to transmit information from a nerve cell or neuron to a target cell. Essentially, a synapse is the junction point between two neurons. As the basic working unit of the brain, neurons are specialized cells within the nervous system that allow the brain to transmit electrically charged messages to other nerve, gland and muscle cells. Because neurotransmitters relay information that causes reactions, such as telling a muscle to contract or a gland to secrete a hormone, anything that affects the behavior of neurotransmitters affects the function of the body. By their effects on neurotransmitter receptor cells, neurotransmitters coordinate behavior by stimulating an action or inhibiting an impulse. Scientists have identified at least 100 neurotransmitters, and evidence suggests we may have a significantly higher amount. Many neurotransmitters are synthesized from precursors like amino acids. Each one performs specific tasks and plays a major role in everyday life and function. To be identified as a neurotransmitter, a chemical must be synthesized in a neuron, must be released and produce a targeted response and must have a mechanism to remove the chemical from the activation site once it has finished its intended function. Neurotransmitters are commonly described as either inhibitory or excitatory. Neurotransmitter imbalances are connected to diseases and health conditions, including Parkinson’s, depression, insomnia, anxiety, cravings, ADHD, memory loss, fatigue, low libido, weight problems and addictions. Aging, chronic stress, nutritional deficiencies, environmental toxins and alcohol and drug abuse are believed to be primary contributors to neurotransmitter imbalances. Many medications are designed to address symptoms of illness by effectively targeting and altering neurotransmitter activity. The identification and function of neurotransmitters remains an open field of scientific study. However, we do now know that a single neuron can produce several different neurotransmitters. Dopamine – Dopamine functions as both an inhibitory and excitatory neurotransmitter and is critical for memory and motor skills. Dopamine plays a role in behavior, learning, sleep, mood, focus, attention, immune health and pleasurable reward. Pleasurable situations, such as eating and sexual activity, stimulate the release of dopamine. Abnormal dopamine levels are associated with attention deficit, exhaustion, Parkinson’s disease and Obsessive Compulsive Disorder (OCD). Certain addictive drugs, such as cocaine and amphetamines, inhibit the re-uptake of dopamine, increasing the amount of dopamine in the reward centers. Stimulants, such as prescription medications that address symptoms of ADD and ADHD, temporarily address symptoms of low dopamine. GABA – As the major inhibitory neurotransmitter widely distributed in the brain, GABA is considered a significant mood modulator. When GABA levels are too low or GABA action is impaired, neurons can become overexcited, which can lead to restlessness, anxiety and irritability. The natural function of GABA is to reduce any overactivity or over-excitability of neurons throughout the nervous system, promoting calmness and relaxation and decreasing brain activity. GABA aids neurons in recovery after firing, helping to reduce anxiety and worry. Pharmaceuticals that enhance GABA action are used to treat anxiety, seizures, restless sleep and other neurological or psychological disorders. Glutamate – The most common neurotransmitter in the central nervous system, glutamate is an excitatory relative of GABA that is involved in most aspects of brain functioning, including cognition, learning and memory. Glutamate is considered a major mediator of excitatory signals, regulating brain development as well as the elimination and formation of nerve synapses. Glutamate is located within the cells, where it remains relatively inactive until needed. It is released in highly controlled amounts and is quickly taken back into the neuron once the message has been delivered. High levels of glutamate are actually toxic and can inflict massive neuron damage if spilled into brain tissue, such as when caused by a stroke or traumatic brain injury. Serotonin – Present in the brain and digestive tract, inhibitory neurotransmitter Serotonin has been identified as an important factor in mood, depression, anxiety, sleep quality, emotions and the regulation of appetite and body temperature. Serotonin imbalances are involved in depression, impulsive behavior, sleep and emotional disorders, increased appetite and aggressiveness. Selective serotonin reuptake inhibitors (SSRIs) are commonly prescribed medications that ease symptoms of depression and anxiety. Pharmaceuticals that help people with depression work by preventing neurons from mopping up excess serotonin. Acetylcholine (ACh) – This widely distributed excitatory neurotransmitter was the first neurotransmitter to be identified. ACh triggers voluntary muscle contraction, controls the heartbeat and stimulates the excretion of certain hormones. Research suggests that ACh may be critical for sleep, attentiveness, sexuality and memory. Alzheimer’s disease is associated with a lack of ACh in certain brain regions. Medications that increase ACh in the brain are the primary drugs used to treat Alzheimer’s disease. Norepinephrine – Also known as nor-adrenaline and widely distributed throughout the body, norepinephrine acts as a neuromodulator, optimizing brain performance. As part of the body’s fight or flight response, norepinephrine quickly provides an accurate assessment of danger or stressful situations. Excessive amounts of this chemical, especially when no actual danger exists, can leave you anxious and hyperactive, while moderately low amounts have beneficial effects on sleep, concentration, inflammation and stress resilience. Epinephrine – Widely known as adrenaline, epinephrine is both a neurotransmitter and a hormone that is essential to metabolism, attention, mental focus and our innate response to stress, fear, anger, panic or excitement. Synthesized from norepinephrine and released by the adrenal glands, epinephrine results in a state of hyperawareness followed by an energy surge that quickens the heartbeat, strengthens the force of the heart’s contraction and opens air passages in the lungs. Abnormal levels of epinephrine are linked to sleep disorders, anxiety, hypertension and lowered immunity. The importance of neurotransmitters cannot be understated. Neurotransmitters control our wondrous and highly complicated human body, including our thought patterns, senses, moods, breathing, heart rate, appetite, digestion, voluntary and involuntary movement, reflexes, hormones, emotions, desires, memories, obsessions and personality. Nutritional support for neurotransmitter synthesis includes amino acids, fundamental building blocks of neurotransmitter production. 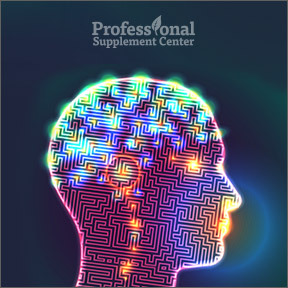 Turmeric, glutathione, NAC, selenium and magnesium all support neurotransmitter activity. In addition, 30 minutes of daily exercise is believed to boost brain serotonin levels. NAC 600 mg by Pure Encapsulations – This free-form amino acid combined with vitamin C provides powerful antioxidant support. As a precursor to glutathione, NAC aids in support of healthy lung function and helps maintain a healthy immune response. Gluten free, Non-GMO vegetarian formula. Liposomal Glutathione by Empirical Labs – Scientifically studied liposomal technology allows for the use of non-hydrogenated phosphatidylcholine as a delivery system for glutathione. Each serving provides 500 mg of reduced glutathione along with 400 mg of natural phosphatidylcholine for optimal absorption, maximum nutrition and potent antioxidant protection. Non-GMO formulation. Turmeric Max-V 100 mg by Douglas Laboratories – Turmeric’s powerful antioxidant properties are believed to play a role in supporting neurological and cardiovascular function. Traditionally used in Ayurvedic medicine to support ocular and gastrointestinal function, one capsule supplies 100 mg of turmeric herbal extract standardized to 95% curcuminoids. Soy free, vegan formula. GABA 750 mg by Integrative Therapeutics – Produced naturally in the brain, this amino acid aids in the production of inhibitory neurotransmitters, calming overexcited nerve impulses, reducing anxiety and aiding relaxation. Gluten, lactose and soy free, vegetarian formula. This entry was posted in Home and tagged Acetylcholine, Dopamine, Epinephrine, GABA, GABA 750 mg by Integrative Therapeutics, Glutamate, Liposomal Glutathione by Empirical Labs, NAC 600 mg by Pure Encapsulations, Norepinephrine, Serotonin, Turmeric Max-V 100 mg by Douglas Laboratories. Bookmark the permalink.